L I V I A: [HOW TO LOOK AND FEEL YOUR BEST] QUICK FIXES FOR AN ALLERGY FACE + BRIGHTER LOOKING EYES! [HOW TO LOOK AND FEEL YOUR BEST] QUICK FIXES FOR AN ALLERGY FACE + BRIGHTER LOOKING EYES! If you're curious to see how you can potentially look and feel your best, then be sure to check out the below for quick fixes for an allergy face and brighter looking eyes. Constantly our eyes are put under stress and can easily be irritated or strained. This could be due to environmental factors, perhaps staring at the laptop for too long or other factors too. This is can potentially lead to your eyes looking strained and very red. There are studies where they have actually shown that when your eyes are bright, white and clear - this gives us the impression that you are happier and healthier. By using the right eye drops for your eyes, this can really look to improve your eye's appearance and health. Also, when it comes to suffering from allergies, it's not always a good feeling. As Spring approaches us tomorrow, some of us all may still be suffering from sneezing, red puffy eyes and constantly blowing your noses. There are quick fixes out there that can help to curb the symptoms in the short term from Zyrtec and Visine. I noted two essential quick fixes that are helpful for sinuses, sneezing, running noses and red looking eyes - along with some expert tips with the Visine and Zyrtec range. Visine is Australia's leading eye care brand which encourages Australians to re-think their eye care regime. So whenever you are experiencing red and irritated eyes, perhaps try the Visine Eye drops in clear as part of your routine to help you relieve any particular eye dryness. I felt that Visine Clear works instantly (in a matter of minutes) to relieve irritated and red looking eyes - especially when they're looking a tad tired. The eye drops provide a relief that lasts for hours (which is ideal if you have a special occasion on or so). 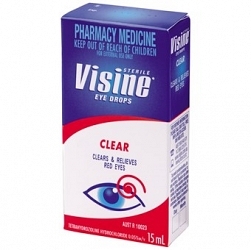 It's recommended that you use Visine Clear for when you have sore, red eyes or when they are feeling itchy or congested by smoke, dust or wind. To simply use, all you need to do is use 1 or 2 drops into the affected eye, up to 4 times a day. Visine can help make "Limbal Ring" more distinctive to the whiter eye, the clearer and more defined the limbal ring appears. The Limbal ring is the dark circle that separates the iris from the white of the eye - somewhat similar to nature's eyeliner. The eye drop range includes: Visine Clear, Advanced and Allergy. VISINE® Clear is the #2 Red Eye drops brand* in Australian pharmacies, providing red eye relief that works in minutes and lasts for hours. The VISINE® range also includes VISINE® Advanced which provides relief of red and dry, burning eyes; and VISINE® Allergy which provides relief of itchy, sore or red eyes due to allergies. We all know that Spring is the most common season of the year for hay fever symptoms which is why Zyrtec is here to the rescue. Featuring a non-drowsy formula, it comes in a nasal spray making it so much easier to relieve from runny noses, itchy noses and sneezing. And did you know that females are more susceptible than makes to experience hayfever symptoms? The nasal spray works in just minutes to last you for hours which is why I opt for this nasal spray for hayfever and allergy relief. It works fast and provides the relief that I need. 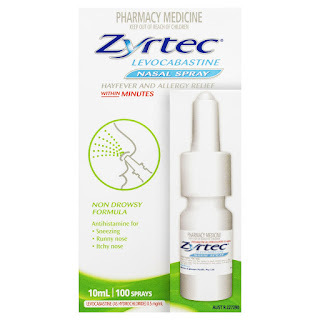 You probably recognise Zyrtec by their tablets range, but you'll be pleased to know that they now come in the form of a nasal spray which is convenient and easy to use. The bottle comes ion 10ml and has approximately 100 sprays. 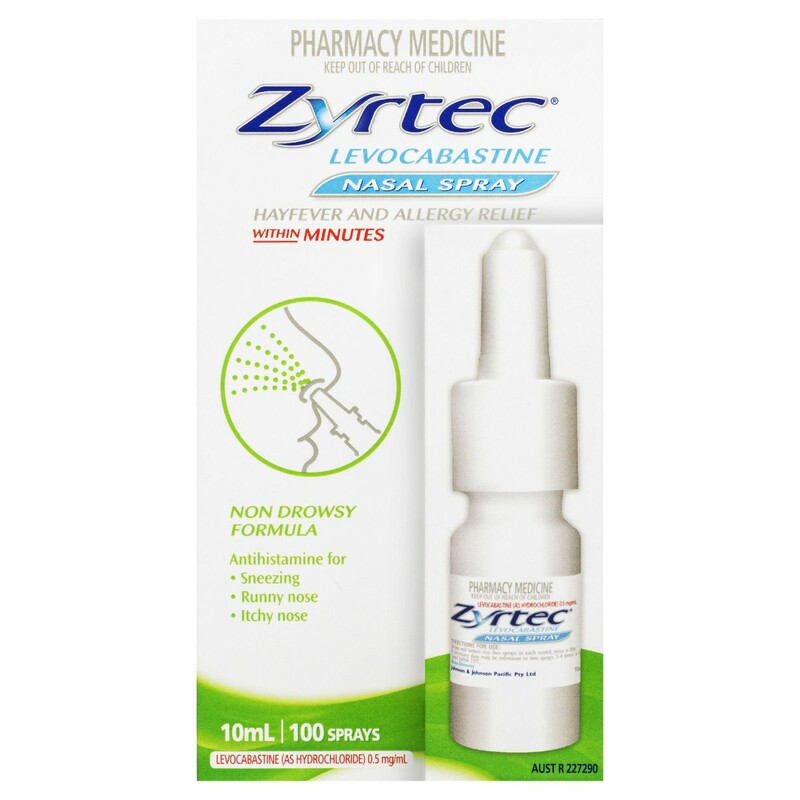 INGREDIENTS: Active Ingredients for ZYRTEC® Nasal Spray: Levocabastine 0.5mg/mL (as hydrochloride), Benzalkoniumcholorid 0.15mg/mL and Disodium edetate 0.15mg/mL (as preservative). Have you checked any of these products above as quick fixes? Thank you Visine and Zyrtec for supporting me for this review. My reviews are based on my personal and true experiences. I only recommend products that I truly support.